New Zealand, Australia and Canada go unbeaten on day one in Dubai. Australia, New Zealand and Canada all recorded clean sweeps on day one of the HSBC World Rugby Women’s Sevens Series in Dubai on Thursday. Coming back to series action after the high of Rio, the Olympic medallists quickly found their rhythm under the hot sun as the season got underway in the Dubai desert. New Zealand will play South Africa in the first quarter-final, Russia await Canada, Fiji face England and Australia meet France with the first Cup of the season up for grabs on Friday at 7he Sevens Stadium. In the Challenge Trophy, Spain play Brazil and USA will meet Ireland. England opened the action in Dubai with a convincing 31-7 Pool C win over Spain before Canada were made to work hard to beat a tough Brazilian side, recording a 26-19 win. 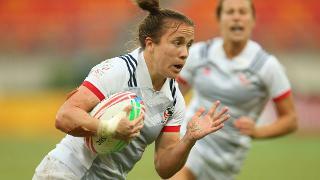 Charity Williams, who stood out for Canada with some important tackles, scored the winning try for her side. Later in the same pool, England easily beat Brazil and Canada defeated Spain. In the final pool match, Canada got off to a slow start but defeated England, 24-12, with the help of two tries from a superb Kayla Moleschi. In Pool B, the Black Ferns Sevens made easy work of Ireland but laboured in their victory over a much-improved Fijian side to win 19-10. Fijiana revelled in the typically warm conditions at 7he Sevens Stadium, beating France 21-14 with an impressive display by Rusila Nagasau. France were no match for New Zealand later in the evening, with Michaela Blyde scoring a hat-trick to ensure a 31-0 win for her side. Elsewhere in Pool B, France fought off a late Irish comeback to win 24-14, but the Irish will rue a missed last-minute conversion that should have beaten Fiji and so had to settle for a share of the points, 17-17. Meanwhile in Pool A, Australia returned to Dubai as Olympic and series champions and Tim Walsh’s players showed their class with a win over South Africa, with Emma Tonegato scoring a hat-trick during a 38-5 win. The Australians then beat Russia 20-7 before seeing out a tough match with a 19-10 win over USA, Mahila Murphy scoring the try that put daylight between the teams. Earlier in the day, USA beat Russia 12-10, before losing 26-7 to South Africa, in a match where South African debutant Nadine Roos scored two important tries. In the penultimate match on day one, South Africa and Russia played out a close match with the Russians getting the win, 19-14, captain fantastic Nadezda Kudinova proving crucial to the victory. The first round of the HSBC World Rugby Women’s Sevens Series continues on Friday when the action gets underway at 9am in Dubai (GMT +4). Find out where you can watch all the action by clicking here.